You and I are in a war for attention. The scarcest (& most valuable) human commodity of all. What is your biggest competition for that customer, for that job, for marketplace recognition? Sun Tzu wrote in the famous Art of War: “Know your enemy.” I’m here to tell you – that enemy is the NOISE. You’re a business professional just trying to be seen and heard. But what are you up against? A tsunami of advertising impressions. Depending on whose data you believe, the average American is bombarded by anywhere from 350-10,000 ad impressions per day. Whatever the amount, we know one thing – it’s a lot of noise. Screens. According to Nielsen, the average American is immersed in 10.5 hours of screen time per day. Think about that. You are David, and screens are the plus-sized Goliath on steroids (still going through a growth spurt). And don’t even get me started on the explosion of digital content (Mark Schaefer refers to this as “content shock“). In our pockets is a constantly-updating noise machine. Life. Your message – which is vital to you – is a mere drop in the bucket of concerns that everyone in your audience is juggling. How are you going to stand out in the swirl of job responsibilities, distractions, family, and entertainment? The human brain. Specifically, the Reticular Activating System, which serves as the filter and gatekeeper of the most precious thing we have to offer – attention. If your message isn’t relevant, exciting, new, or entertaining, it gets filtered out. It joins the other noise. These are formidable opponents. And here’s the deal – the noise level is increasingly. Exponentially. If we can’t rise above the noise, we lose opportunity – every day. Everything you are planning to do today to promote your business? If it’s not designed to rise above the noise, it joins the noise. I remember the early days of social media, when it was actually possible to connect with people and have interesting conversations. Twitter was a cool discovery engine; blogs were a great way to generate discussion. Now, social platforms are so overrun with noise and static that it’s almost impossible to be heard. Friends were quick to point out the obvious reason that this approach wasn’t working. Most told me I had to know someone who would pass my resume along to a hiring manager. By trying to game that system, I inadvertently learned how powerful it really is. One 2014 study found that 30%–50% of hires in the U.S. come from referrals, and referred candidates are over four times more likely to be hired than non-referrals. According to one hiring consultant’s estimate, referrals lead to a whopping 85% of critical jobs being filled. In the booming age of noise, here’s the most crucial advantage we can give ourselves: a Referral Strategy. We might have a marketing strategy, a sales strategy, even a networking strategy. But do we – as individuals and businesses – have a referral strategy? Do we know exactly how we’re going to rise above screens, ads, life, and the RAS? If we seek to fight noise with more noise, we lose. It’s the wrong weapon for the battle. Turns out that the best way to win the war for attention is exactly what it has always been – the personal/professional referral. And to become referral-ready, the very first thing you need is a clear focus and message. 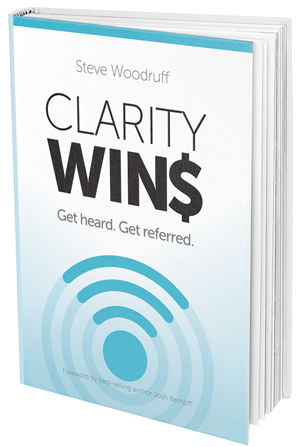 Clarity that leads to referrals. Let’s work on that together before another opportunity is lost!